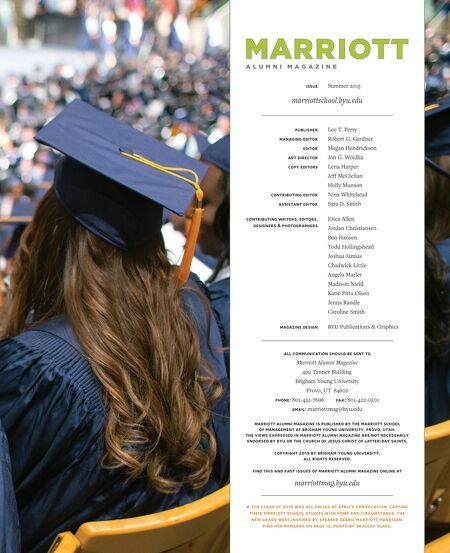 Marriott Alumni Magazine Issue Summer 2015 marriottschool.byu.edu Publisher Lee T. Perry Managing Editor Robert G. Gardner Editor Megan Hendrickson Art Director Jon G. Woidka Copy Editors Lena Harper Jeff McClellan Holly Munson Contributing Editor Nina Whitehead assistant editor Sara D. Smith contributing writers, editors, Erica Allen designers & photographers Jordan Christiansen Ben Hansen Todd Hollingshead Joshua Jamias Chadwick Little Angela Marler Madison Nield Katie Pitts Olson Jenna Randle Caroline Smith magazine design BYU Publications & Graphics All communication should be sent to Marriott Alumni Magazine 490 Tanner Building Brigham Young University Provo, UT, 84602 Phone: 801-422-7696 Fax: 801-422-0501 Email: marriottmag@byu.edu Marriott Alumni Magazine is published by the Marriott School of Management at Brigham Young University, Provo, Utah. The views expressed in Marriott Alumni Magazine are not necessarily endorsed by BYU or The Church of Jesus Christ of Latter-day Saints. Copyright 2015 by Brigham Young University. All rights reserved. 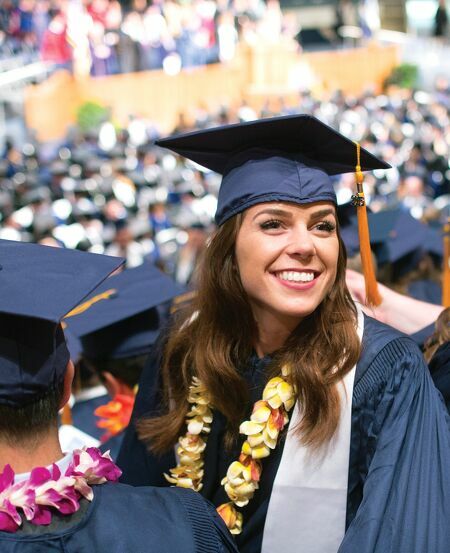 find this and past issues of marriott alumni magazine online at marriottmag.byu.edu the class of 2015 was all smiles at april’s convocation, capping their marriott school studies with pomp and circumstance. the new grads were inspired by speaker debbie marriott harrison. find her remarks on page 12. photo by bradley slade.